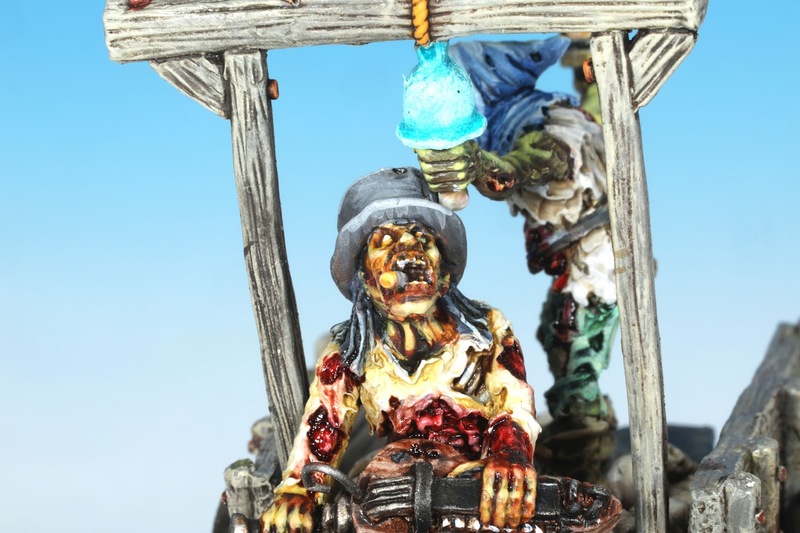 Acceptable Radiation: Bring Out Yer Dead [Lead]! There is no denying that the Mayor was an odd and often polarizing figure, but nothing stood out more than his steadfast protection of religious freedom and refusal to impose the rites of the Imperial Cult on the people of Karr-Keel. Not surprisingly, in the absence of official religion, strange new rituals cropped up throughout the city. And, in spite of the Mayor’s protests, he played a central role in many of them. One that drew adherents from all over the city was the Fellowship of the Flames, which preached that those who died on the Mayor’s birthday were truly blessed, and celebrated the great event by burning the bodies of the blessed dead on a giant bonfire after the Mayor’s birthday cake was served. 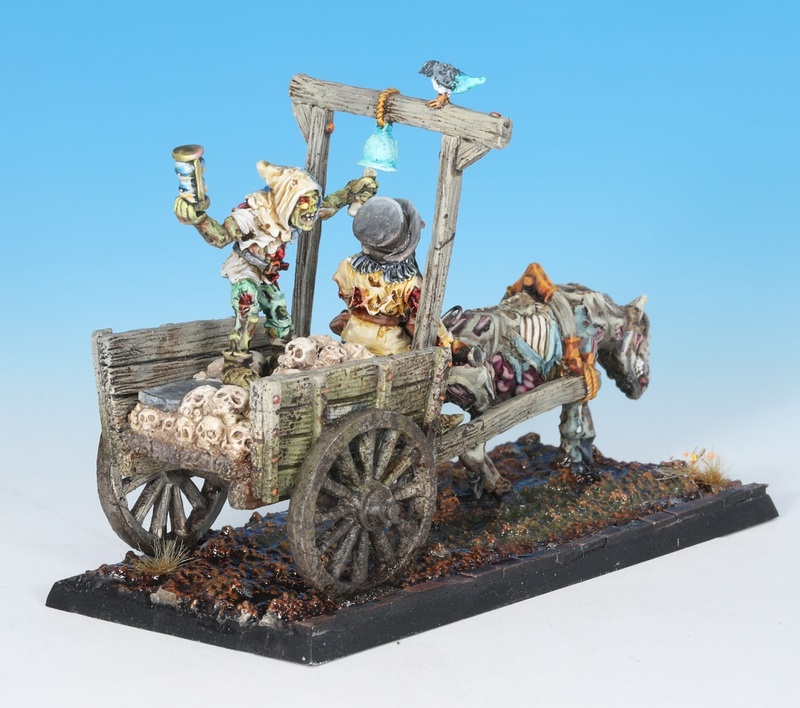 This ceremony was a particular favorite of the Teamsters Guild, and their festively decorated carts could be seen making their way through the streets of Karr-Keel as they gathered up the freshly dead for the Fellowship’s Great Fire. Surrounded by costumed partygoers and entertainers, and showered with coin thrown by ecstatic adherents, each cart was enveloped in its own processional of color, sound, and infectious enthusiasm. 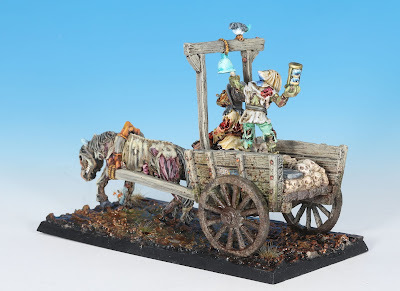 There is some irony in the fact that, of all the people of Karr-Keel, only the new dead on their way to the Great Fire failed to rise again in the wake of the Necroburgher’s curse. Perhaps the Fellowship was right, and they were the blessed few. Regardless, many of these carts still travel throughout Karr-Keel, gathering up the remains of vagabonds, thieves, and adventurers who are drawn to their doom in the cursed city by the siren’s song of riches and power. What the rotting teamsters do with their haul is anyone’s guess. Who knows what use the Necroburgher has for such gristly things? 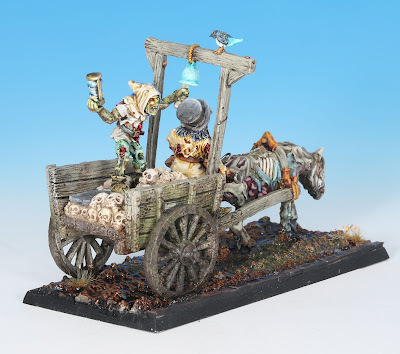 When the Zombies of Karr-Keel Teamster's Cart first arrived from the casters, it, unfortunately, sat on my table for a good long while because it had the misfortune of arriving while my basement was being remodeled. It got tossed on a pile until I could get to it. And even when I could start working, I was limited to mostly cleaning and working on the base. 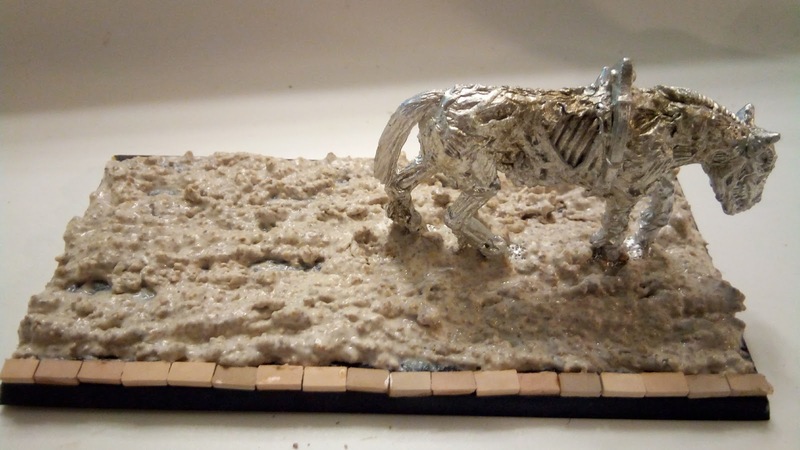 But it was kinda fun to mix up all the wood glue, fine ballast, cork bits, and plaster to create such an awful mess. 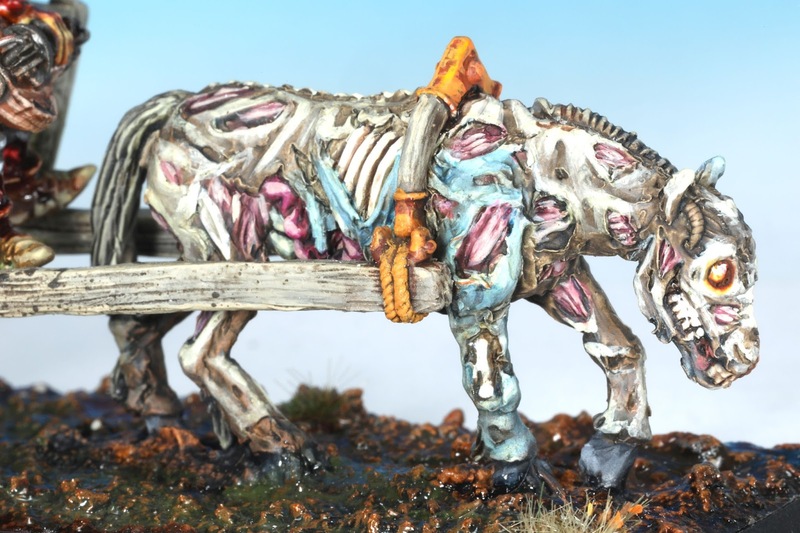 But it came out great, and covered the non-slotta nature of the zombie horse. 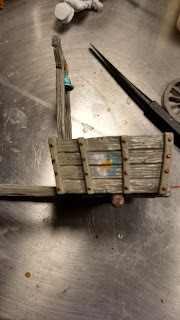 I also added some bricks along the side to give it the look of a curb and to carry the feel that the cart is rolling through a nasty, decrepit town street. Once I got to start painting, the cart went pretty fast. Although I will give one assembly tip, don't put the top piece with the bell on until both riders are in place. More on that later though! 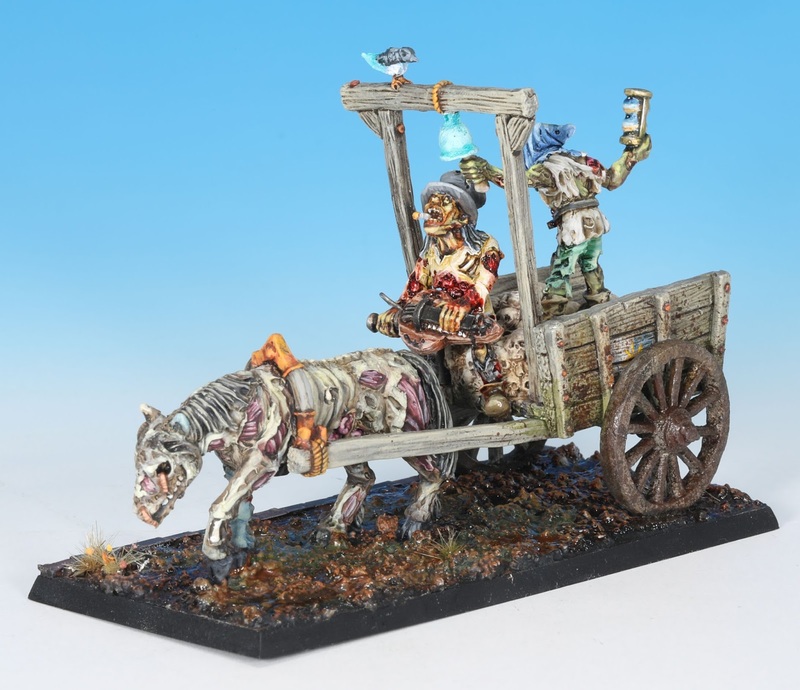 The cart was largely painted in my standard old wood method of P3 Bastion Grey, highlighted up by mixing in bone and then applying a brown oil wash, nothing too fancy here. 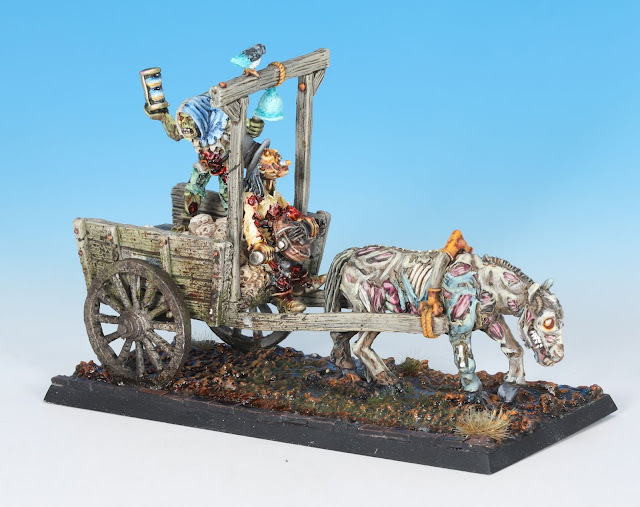 And after the cart was built, I spattered lots of Vallejo splash mud on it. That is a nasty street after all! Another thing I wanted to add to the cart, which ended up being lost behind the wheels in the final results was a link to the real-world teamsters. Now the real-world teamsters logo is a golden yellow star on a field of blue with a white border. But this is the Old-World, so it has to look more heraldric than that. So I took the blue and white and halved a shield shape and did a golden eight point star instead of the six pointer used in reality (hey, it's warhammer--an eight point star fits great). All this was done by stippling the several shades of each color over the rotted wood. You can see each side below. 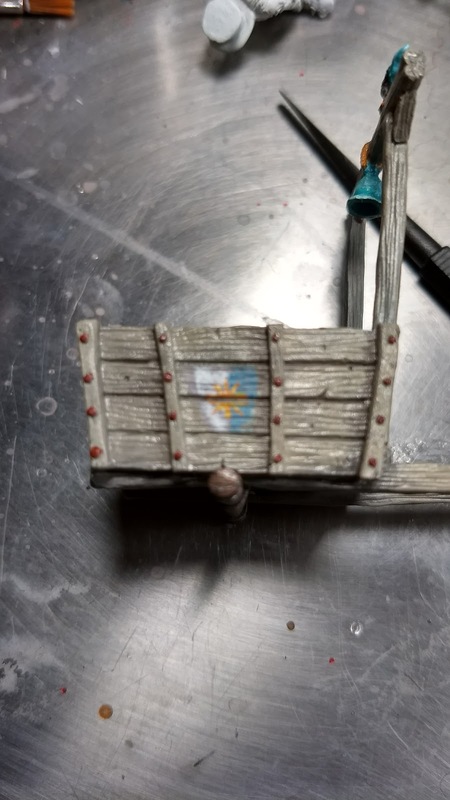 I purposely did it so it's faded and hard to see to simulate the paint falling off the rotting wood. 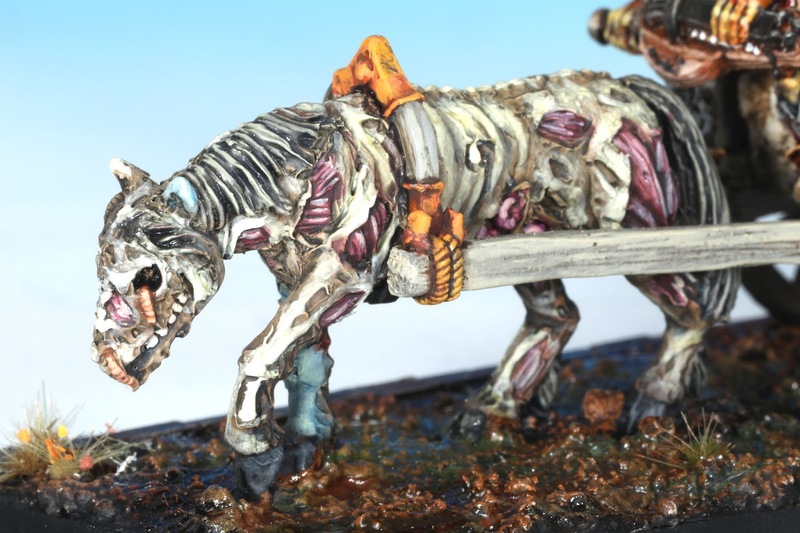 The horse was largely painted the same as the previous zombies, starting with baneblade brown and mixing up the highlights with Kreig Khaki. However, I did add a blueish section on one leg and part of the trunk to break up the monotony of all the browns on this model. One thing I was sure of when I began painting this was I did not want to paint the bird as a boring crow or raven. That is just way too cliche. However, crows and ravens have a cousin that would was perfect for the role--the magpie. Magpies are also carrion birds but they have a bit more color to them. I found pictures of some with vibrant blues and greens in their wings. I was going for green on this one, so it didn't blend in with the verdigris on the bell, but it ended up coming out blue anyway! I also purposely did little with the skulls. While a major part of the model, I did not want to invoke the "moar skulls" cliche that is so prevalent in modern Citadel Miniatures. They're there, they're painted, but there is also nothing special. Besides the poor horse and the two crew were oozing character on their own, no need to distract the eye from them. For the passenger, I wanted to carry over the teamster's white and blue, so I painted his hood with that pattern. I imagine in life, he would have worn his guild's colors while working so everyone knew he wasn't just some body thief. His skin was painted the same green method used in the previous batch of zombies. The hourglass in his hand was a complicated bit to figure out. I had the zombie on pins so I couldn't put him on the model to see where the light would be hitting it without scratching it up. and I'm a little slow on the uptake sometime so I had a hard time figuring out how he was riding on the cart! The first time I saw the cart driver, I was instantly thinking of Slash from Guns N Roses. And so I painted him as zombie Slash: black top hat, white shirt, and black leather pants. Including the addition of a cigarette in his mouth! 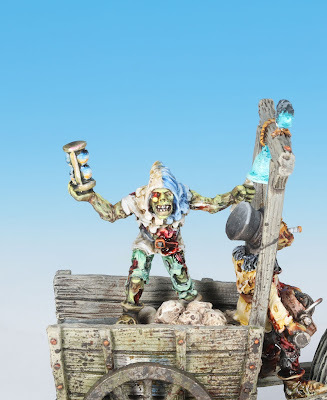 I also added a popped string on the Hurly Burly his is playing to further indicate the age and the fact that zombie are not known for their meticulous maintenance of things. Slash's flesh is based on Vallejo Game Color Scrofulous Brown (I think, the text on the label has worn off). But, much like the others, this was highlighted up with Krieg Khaki and shaded with several brown, sepia, and purple washes and glazes. For anyone who likes zombies, I highly recommend picking up some of Kev Adams's work on this project. Thanks, although the credit for the combination of elements has to got to Kev Adams! Thanks, it's all about creating contrast, so I've been told! Oh yeees! Masterpiece sir, dark masterpiece! "dark masterpiece," I like it! Saw this on Facebook and was wowed. Am wowed again mate. It's a great model, you should buy one! The piece came out great Andrew. One of the best from you mate! well done!